The Economic and Financial Crimes Commission has put a former Governor of Rivers State, Dr. Peter Odili, under surveillance, The PUNCH learnt on Sunday. Also, investigations revealed that the Economic Governance Unit of the commission, which has been working on the case against Odili, had intensified efforts to vacate the perpetual injunction obtained by the ex-governor to restrain the commission from arresting and prosecuting him for fraud. A top operative of the EFCC, who confided in our correspondent on Sunday, said the commission was making fresh efforts to vacate the perpetual injunction, which was granted by a Port Harcourt High Court. The ‘Interim Report of the EFCC on Governor Peter Odili’ had alleged that “over N100bn of Rivers State funds have been diverted by the Governor, Dr. Odili”, and contained serious allegations of fraud, conversion of public funds, and money laundering, among others. Odili, as the sitting governor of Rivers State, had approached the Federal High Court in Port Harcourt in February 2007, asking it to grant him an order preventing any law enforcement agency from arresting, harassing and prosecuting him for fraud. 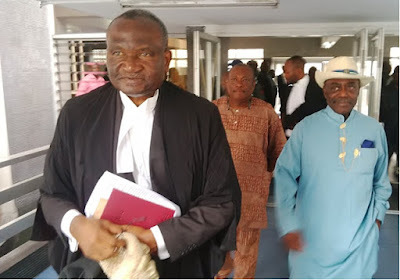 On March 23, 2007, Justice Ibrahim Buba granted Odili’s prayers, including a declaration that the EFCC investigations were invalid, unlawful, unconstitutional, null and void. He also granted an injunction restraining the EFCC and the other defendants from publicising the report of the investigation; and an injunction restraining the EFCC from any further action in relation to the alleged economic and financial crimes. On Sunday, the source told The PUNCH that the EFCC had not been able to reopen fresh investigation into the case of the former Rivers State governor because of the subsisting restraining order, which was granted in March, 2007, by Justice Buba. It was stated that the commission had assigned operatives to monitor the ex-governor pending the time the Court of Appeal in Port Harcourt would determine the matter. The source added that the security ring around the former governor had become imperative in order to prevent the Peoples Democratic Party chieftain from leaving the country. The Head of Media and Publicity of the EFCC, Mr. Wilson Uwujaren, confirmed that the appeal against the restraining order was in court. “The case is the subject of an appeal before the Court of Appeal in Port Harcourt,” said Uwujaren without giving further details. When contacted on Sunday, the Special Adviser to the Attorney General of the Federation on Media and Publicity, Mr. Salihu Isah, said only the minister was competent to speak on the moves to vacate the perpetual injunction granted the ex-Rivers governor. “It is the minister that has the details and competent to speak on the issue,” he said. The Presidential Advisory Committee Against Corruption had described the orders as odious, perverted and unacceptable during a briefing in Abuja on Monday. The Executive Secretary of PACAC, Prof, Bolaji Owasanoye, explained that many of the orders, which he said were appealable, had been appealed. Owasanoye had stated that a particular judge, who was notorious for granting such orders, had been removed from the bench. He had added that any order, which made it impossible for anti-corruption agencies to investigate suspects who did not enjoy immunity, was only demanding the scrapping of the police, the EFCC and the Independent Corrupt Practices and other Related Offences Commission. He had said, “Secondly, one of the judges, who is notorious for giving these orders has been removed from the bench. I am sure you all know that he has been removed from the bench; because we also made public some of those orders and their implications. “When you say a suspect cannot be arrested, investigated or prosecuted, you are actually saying that it is better to shut down the anti-corruption agencies. “This is because if all of us can’t be arrested, we can’t be prosecuted, what are you doing with the police then? What are you doing with the EFCC? What are you doing with ICPC, because every potential suspect enjoys immunity; so, the best thing is to shut them down. Meanwhile, a source in the commission told The PUNCH on Sunday that the EFCC had traced some properties within and outside the country to one of the judges currently under the probe of the anti-graft agency. The source, who spoke to our correspondent on condition of anonymity, said the team of operatives, who raided the residence of the judge in Lagos, stumbled on documents that bore the name of the judge, linking the judge to properties in Nigeria and outside the country. It was learnt that the operatives were also screening bank accounts in the name of the judge and in the names of some of the children. “The search yielded documents that would assist the commission’s investigations, including bank accounts in the name of the judge and those bearing the names of the children and property titles both in Nigeria and abroad,” the source said.